Has Britain’s referendum victory been stolen? The forces of darkness have quickly reasserted themselves and the portents are now very grave. Both the outgoing prime minister David Cameron and his possible successor Boris Johnson are both now saying trade must come before immigration curbs. Nigel Farage, the face of Brexit, has accused them of backsliding but may himself have been already “frozen out” out of the European exit negotiations by more establishment figures in the broad Brexit alliance. This would only confirmed the growing suspicions about the real motives behind the Conservatives who had so belatedly joined the Leave camp. Boris Johnson was worryingly vague about any change of European freedom of movement rules saying “It is said that those who voted Leave were mainly driven by anxieties about immigration. I do not believe that is so.” If there is a stab in the back then it is an inside job. But it is the statements made by two prominent UKIP members, two prominent Leave members, one UKIP one Conservative, that have really caused alarm. Both Douglas Carswell and Dan Hannan are still committed to freedom of movement across Europe which essentially negates the entire point of the referendum in the minds of most voters. Both Carswell, who is an MP, and Hannan, who is an MEP, are prominent conservative writers with strong free market affiliations and City of London connections. But while both men are disloyal to Nigel Farage and worryingly “flexible” on the core issue of immigration, there are some causes to which they do display unquestioned loyalty. Both are staunch friends of Israel and have gone out of their way to reassure the Jewish community that, whatever happens, they do not need to worry. Indeed Carswell addressed a Westminster reception for UKIP Friends of Israel eighteen months ago, which firmly established the party’s FoI group as its most powerful internal grouping. In that speech, Carswell said he saw his role within UKIP was to stand up and defend Israel. It was a curious priority and not the only one. Carswell said that one of the first things he did after abandoning the Conservatives for UKIP was to call Conservative Friends of Israel’s Stuart Polak to assure him he would “always remain” a “friend of the Jewish state” despite his defection. Nevertheless, it is a theme Carswell has returned to again and again. He has said that for him Israel embodies the idea of self determination. “almost providentially you might say.” He said EU is full of people who question the existence of Israel. Carswell has made some eye-popping quotes defending Israel in the past. Israel is unable yet to find a lasting peace in the West Bank, or with Gaza or south Lebanon. That tells us more about the tyrants who run those territories. If only the White working class of England could find such a straight talking champion. Carswell’s friend and political soul mate in the Leave camp, Conservative MEP Dan Hannan, also places the highest priority in his courting of the approval of this tiny part of the British population. When he is not urging Britain to import Jews, he is castigating the Palestinians for their behaviour during Operation Cast Lead. Here he is warning a rapt Jewish audience in Israel that Western politicians are over concerned with Muslims. In an insightful speech criticising the EU, Hannan explains that the sacrifice of democracy had always been accepted as an inevitable consequence of the EU vision and that the founders of the European Union never intended it to be a democracy. The EU is founded on the idea that national loyalties are arbitrary, transient and ultimately discreditable. The nation state is a bad thing which causes wars and is illegitimate. There is no purer embodiment of the ideal of national self-determination than the state of Israel. There is nothing like it in human history. Here you have this extraordinary story of a people who for 2,000 years are stateless and scattered but who never lose the aspiration of a national home. And then one day, miraculously, providentially, you might say, they fulfil it. Now if they were right to that then everything the European Union has done since 1957 has been a mistake. People really are better off living under their own laws, with their own language. And the whole intellectual argument for transcending the nation state and transcending the idea of Europe is false. And that is why Israeli spokespeople are always going to struggle to get a sympathetic hearing in Europe. Israel is the supreme embodiment of the idea that every nation should have its own state and territory. All of which is very admirable but eagle-eyed TOO readers might have noticed that the speech omitted a couple of points that might be worth making. Namely, if Israel is to be allowed its own territory then why do White European nations not have the same right? And if the existence of Israel is “providential” what is it about White nations that they are denied the same God-given right to exist? And left-wing Jewish dissident Gilad Atzmon pointed out that some of the Brexit leaders were “dedicated servants of the Jewish lobbies” and cautioned that a vote for Brexit is not a vote for leaving the neoliberal global system. Goldman Sachs, George Soros and others who fecklessly destroy one country after another are also not part of the Brussels Government. The British vote was actually a vote against Goldman Sachs, Soros, Friedman and cultural Marxism, but most of them do not know it yet. The Brits voted against immigration, banksters, the global economy, the City and the two parties that have facilitated this disaster for decades. However, the Brits failed to attack the root cause of the problem. Just as in the Conservative Party, the Friends of Israel might be the most powerful lobby group in the UKIP ranks. One influential member seems to be Shneur Odze, who stood as a UKIP candidate at the last European elections. He arranged for Carswell to meet two important Jewish groups, the Jewish Leadership Council and the vigilante group, the CST. Thanks to Jewish members like Schneur Odze, UKIP can now proudly boast that it has cleansed itself of the toxins of White advocacy. The party does not allow former members of the BNP or EDL or any other White group to join — a far more stringent rule than other parties. Brexit has also handed the Israel lobby a wonderful opportunity to remove a thorn in their side — Labour’s leader Jeremy Corbyn, a Marxist open-borders fanatic and long-time supporter of the Palestinian cause. When Corbyn was elected on a wave of grassroots Muslim and left-wing support, the shock to Jewish politicians was palpable. They had lost control of one of their two most valuable assets and one they considered their personal fiefdom. So Corbyn had to go — by hook or crook — and that led to the anti-Semitism witch hunt which from beginning to end can be characterised as the biggest “hate crime hoax” in British political history. Time after time it has been shown that the examples of “anti-Semitism” are risibly thin. They mainly involve tweets or re-tweets from years ago, usually from low-level activists, sometimes teenagers. Accusers have been exposed as working for Jewish lobbying organisations, but it has all been to no avail. From left to right the media have been happy to repeat the anti-Semitism claims without subjecting any of them to any kind of scrutiny. At times the coverage devoted to this exceeded that of the Brexit debate itself, it was a sickening display of the extent of media servility when the anti-semitism dog whistle is sounded. You don’t have to have any time for the likes of Corbyn to see how astonishing it is: A clearly manufactured crisis is being used to drive a legitimately elected party leader out of office. It is nothing short of a mini coup d’etat and unprecedented in British politics. The latest ongoing episode of this farce involves the choreographed mass resignation of dozens of shadow cabinet ministers and front bench MPs in an effort to shame Corbyn into resigning. It is a strategy that has been months in the planning and although the resignations include various Jewish MPs and friends of Israel stooges, two other senior figures offstage seem to have played prominent roles in planning the coup. One is a veteran labour politician called Lady Margaret Hodge (nee Oppenheimer), who was one of the wealthiest Labour MPs in Parliament and a staunch Friend of Israel. Hodge is a keen supporter of ethnic cleansing and not just in Israel. When the White working class in the London constituency of Barking and Dagenham rose up by voting in nationalist BNP councillors it was Hodge who led the suppression of the rebellion with the Labour Party pouring money and supporters into the area. 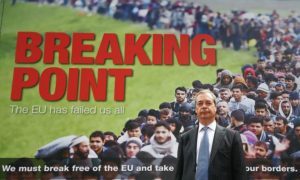 Since then the constituency has been flooded with even more asylum seekers from Africa and the Middle East and the remaining White community has shrunk rapidly. It was widely seen as a punishment. The second alleged conspirator is a Israel lobbyist called Jeremy Newmark who is the chairperson of the Jewish Labour Movement which is affiliated not only to the British Labour Party but the Israeli Labour Party and the World Zionist Organisation. He has been described as being “at the forefront of the current witch hunt” and has a track record of lobbying against Palestinian supporter groups and attacking BDS initiatives. He is a former chief executive of the Jewish Leadership Council. Will this crisis and the tensions it exposes lead to a break up of the Labour Party? Some pundits think so and some think it could be replaced in the north of England by UKIP which ran it a close second in 120 seats. UKIP MP Douglas Carswell seems to believe this will happen. Other commentators are also predicting that this means the end of the Labour Party. In the Mail Dominic Sandbrook says he fears Labour is finished. In the Telegraph it is what Tom Harris does say, then does not say, that is interesting. Labour MPs are angry at Jeremy Corbyn’s lacklustre role in the failed campaign to keep the UK in the EU. But that’s not the reason they’re trying to get rid of him. The main reason they want to remove Jeremy Corbyn as leader of the Labour Party is that Jeremy Corbyn makes Labour unelectable. What he does not say is that is because it has been deserted not only by big money Jewish donors but also of its media influence — much the same thing. So perhaps a Labour Party that is not entirely under the sway of Israel’s interests may be broken up into its constituents parts to prevent it from becoming a threat. There is a precedent for this as anyone looking at the recent history of the Middle East will confirm. How ironic it would be if a Labour Party that had unshackled itself from the bonds of Jewish control was dispatched to oblivion only be to replaced by a UKIP which is in every sense a fully paid up Friend of Israel.